George England started making his patent screw jacks and weaving machines but was interested in railway engineering from the beginning, having sold tools to the London & Southampton Railway in 1839 and in 1843 had tried out his ‘manumotive railway carriage’ This was a man-powered inspection trolley. 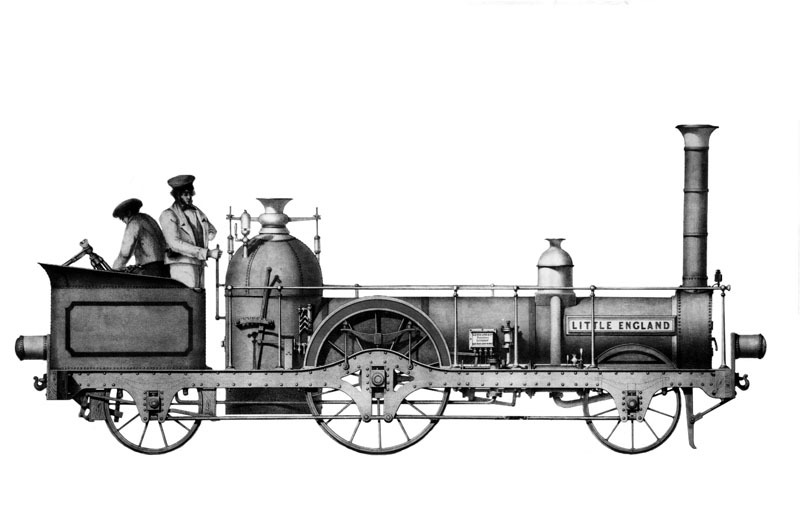 He began making locomotives, selling his first in 1849. These were small light engines which were of limited use as loads increased so his engines gradually got bigger. He supplied locomotives to lines in the UK, Europe, India and Australia. He also produced castings for other purposes and was very involved in the ironwork for the new Crystal Palace which opened in 1854. He is best remembered for the locomotives he built for the Festiniog Railway, which proved that steam power could be used on narrow gauge railways, leading to many countries having railway systems that would not otherwise have done due to the difficulties of building full size lines. He was latterly considering moving into marine boilers, but this never happened and the attempt by Fairlie and George England Jnr to start their own company was, for various reasons, unsuccessful. Around 250 locomotives are thought to have been made at Hatcham. Please see the archive section for further details of individual products. For further detailed information on Hatcham Products, please click on the link below to visit the archive section of this website which is updated regulary with new information as it comes to light. Copyright Maybrey Reliance © 2019. All rights reserved.